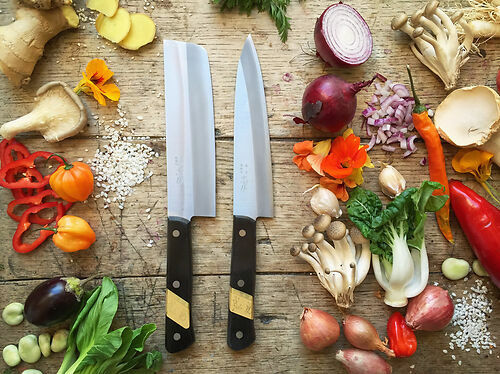 Beautiful, highly practical kitchen knives from Sanjo, with the weight and feel of a western-style knife but with a Japanese blade. Blue paper aogami steel, wrapped in an outer layer of stainless, is some of the finest steel around. The handle is pakka wood - resin treated, laminated hardwood. These are a perfect choice as all-rounders for every day use, especially if you're new to Japanese knives. Niwaki Tip: Treat your knives well and they'll repay you - hand wash, store separately and sharpen every couple of weeks with a whetstone.